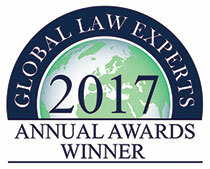 Over recent months, Global Law Experts (GLE) has conducted its extensive nomination and research process for the 8th Annual GLE Awards. The shortlisted candidates were judged on client testimonials, key cases, legal rankings, overall reputation, publication contribution, speaking engagements and the performance and standing of specific teams and individual lawyers. During the recommendations stage GLE received over 150,000 responses from business directors, in-house legal counsel, independent law firms, high net-worth individuals, bar associations, visitors to the GLE website and LinkedIn users. These recommendations were combined with GLE’s own independent research in order to create a shortlist for each award category. GLE is one of the world’s leading online resources for locating specialist legal advisers for the services required by businesses, investors and individuals. The website has shown double digit user growth month on month since inception with currently over 30,000 users visiting our website each month. The GLE awards have been running since 2010 and have helped many winners to further enhance their exposure to potential clients and to reaffirm their position as a market leader in their field. The ACQ5 Global Awards, launched in 2005 and now in its 12th year, were the first of their kind in the global legal / financial publishing industry. The nature of the industry is changing, and this year they have made fundamental changes to the categories in ACQ5 Global Awards to reflect this. The main purposes of these changes are: to focus on organizations and individuals that can demonstrate an ability to deliver services and skills to meet clients’ needs and adapt to market and regulatory conditions and to consider candidates that may not always be global in scale, but are truly world class in the way they are run and in the services they deliver to clients. ACQ5 Global Awards decisions are firmly based on peer nominations following the receipt of detailed submissions from market participants and extensive year-round research into the markets in all global region. ACQ5 Global Awards cover global categories, best-in-class awards in all regions in over 100 countries around the world. So, we at Maddock & Bright IP Law Office are pleased to announce that our firm represented by Mr. Abdelwahab Moustafa has been chosen as The Game Changer of The Year in Egypt. InterContinental Finance & Law Magazine is a leading monthly industry publication. Carrying clear, concise reports and reviews, highlighting the very best advisors, lawyers, financiers and banks across all Continents, whilst displaying Global transactional activity. Its Global Awards are one of the most highly regarded Awards Campaigns in the legal and finance diary. It therefore as a direct result of research, our firm has been selected as an InterContinental Finance Magazine & Law 2017 Global Awards Winner. 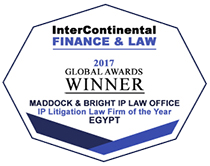 So, we at Maddock & Bright IP Law Office are pleased to announce that our firm represented by Mr. Abdelwahab Moustafa has been chosen as the exclusive winner of IP Litigation Law Firm of The Year in Egypt.